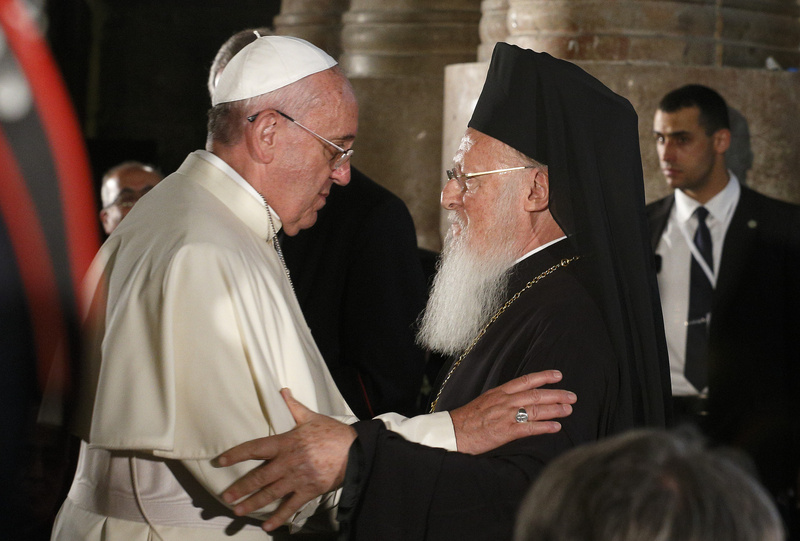 Half a century after a historic encounter between their predecessors, Pope Francis and Ecumenical Patriarch Bartholomew met in the same place to seek inspiration for Christian unity at the site of Christ's death and resurrection. "We need to believe that, just as the stone before the tomb was cast aside, so, too, every obstacle to our full communion will also be removed," the pope said on May 25 during a prayer service at the Church of the Holy Sepulcher. "Every time we put behind us our longstanding prejudices and find the courage to build new fraternal relationships, we confess that Christ is truly risen," the pope said, his voice hoarse and expression fatigued after two full days of public appearances in the Holy Land. The pope also spoke of an "ecumenism of suffering, an ecumenism of blood," which brings Christians closer through the common experience of persecution. When others kill Christians, he noted, they do not ask if they are Catholic or Orthodox. Patriarch Bartholomew said Jesus' tomb sends the message that "history cannot be programmed; that the ultimate word in history does not belong to man, but to God. In vain did the guards of secular power watch over this tomb. In vain did they place a very large stone against the door of the tomb, so that none could roll it away." The patriarch said the tomb also encourages Christians to "love the other, the different other, the followers of other faiths and other confessions." Their prayer service marked the 50th anniversary of an encounter in Jerusalem between Pope Paul VI and Ecumenical Patriarch Athenagoras of Constantinople. The earlier meeting, which led both churches to lift the mutual excommunications that started the East-West schism in 1054, opened the modern period of ecumenical dialogue. Pope Francis and Patriarch Bartholomew reached the square in front of the church a few minutes after 8 p.m. They arrived from opposite sides and met in the center, where they embraced before entering the church. Inside, they participated in common prayer with representatives of the Greek Orthodox, Armenian and Catholic churches, which share custody of the building. The event was extraordinary because members of the three communities usually observe a strict separation when praying inside the church. Representatives of other churches present in the Holy Land—including Coptic, Syriac, Ethiopian, Anglican and Lutheran archbishops—also participated in the ecumenical celebration. At the beginning of the service, which featured songs and readings in Greek and Latin, the pope and the patriarch knelt and prayed together before the stone of unction, a red limestone slab traditionally believed to be the surface on which Jesus' dead body was anointed for burial after the crucifixion. Both Patriarch Bartholomew and Pope Francis gave short addresses, the former speaking in English and the latter in Italian. Later, the pope and patriarch entered the aedicule, a small wood building containing Jesus' tomb. They knelt before it and kissed it. After exiting they climbed a stairway to Mount Calvary to light candles at the site of the crucifixion. Earlier in the evening, the pope and patriarch met privately at the apostolic delegation, the Vatican's representative office in Jerusalem, where the pope was to spend the second and final night of his visit to the Holy Land. The two leaders spent more than an hour together, more than twice as long as scheduled. They emerged with a signed common declaration calling for "communion in legitimate diversity" between their churches. "We look forward in eager anticipation to the day in which we will finally partake together in the eucharistic banquet," the pope and patriarch wrote, calling for continuing "fraternal encounter and true dialogue" to "lead us into all truth." Their declaration also called for common efforts in the "service of humanity, especially in defending the dignity of the human person at every stage of life and the sanctity of family based on marriage, in promoting peace and the common good" by struggling against "hunger, poverty, illiteracy (and) the inequitable distribution of resources." The leaders also stressed the need to protect the natural environment and defend religious liberty, especially for embattled Christian minorities in the Middle East. The Vatican had emphasized that the pope's meeting with Patriarch Bartholomew was the main reason for his densely packed, three-day visit to the Holy Land. The two leaders were scheduled to meet a total of four times during the visit, whose official logo was an icon of the apostles Peter and Andrew, patron saints of the churches of Rome and Constantinople, joined in a fraternal embrace.